Whenever you have a small package or large shipment that needs to be shipped from China, you will need the services provided by an international courier company. Currently, four of China’s major shippers are DHL, FedEx, UPS and TNT, who account for most of China’s international courier share. These shippers play an important role in international operations and transport. These couriers are known for providing courier at the right time and place. Their delivery scope is not limited to one country or continent. If you choose one that offers truly international services, the services they provide are what you want. International Express will have a huge transportation network, all your goods can be delivered accurately. That’s why most companies and individuals like FedEx cargo and documents service. Do you know what they are in China and why you choose them to transport your parcel goods. These courier companies can bring many benefits. On the one hand, it helps to improve the reputation and reliability of your business, especially if you need an efficient delivery approach and delivery of goods needs to be done within the desired time. The main advantage of these famous shipping companies is that it can help your company to invest in a professional image of responsibility. Slow delivery can lead to negative images of your customers. So when it comes to choosing your parcel transporter, you need to do some research. Now let’s take a look at these four courier companies. DHL is currently one of the world’s largest air courier freight companies, established the world’s premier global delivery network. They is a global market leader in the international shipping, courier and Logistics industries. DHL offers customers a full range of logistics solutions from file to supply chain management, and you can also get customized shipping solutions. DHL can provide services that meet your needs, whether it’s a document or package, whether it’s a second day, overnight or day limit delivery. As the first international courier company to enter the Chinese market, DHL China has become the largest international express supplier in China. At the same time, China has become the world’s largest market for DHL. Today, DHL is expanding and upgrading its trans-shipment hub and network across most of its population agglomerations and economic center cities. DHL is well trained and professional delivery specialists to provide quality service and maintain its position as the world’s leading international Air Express network. FedEx is one of the world’s largest express shipping companies, providing efficient end-to-end solutions to help you solve the complex problems of global transportation. Also, FedEx has a global air and land transport network, which typically takes only one to two business days to quickly deliver timely shipments. FedEx has 12 major logistics hubs around the world, covering more than 650 airports. We can see FedEx aircraft everywhere. It means It can offer provide fast and reliable courier services for more than 220 countries and regions around the world in 1-2 business days. 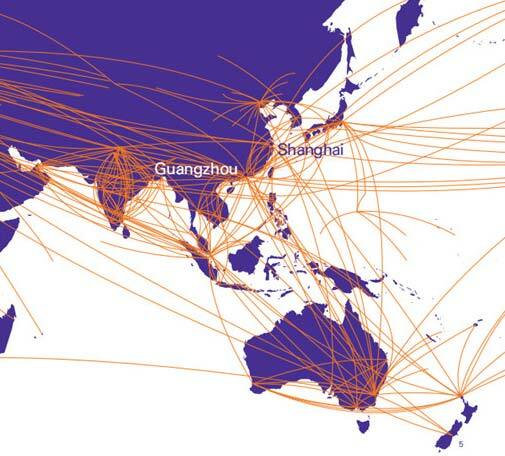 So far, FedEx has built two cargo hubs in China, Shanghai and Guangzhou, connecting the entire Asia-Pacific Economic Zone. One hub lies in the central area of the Pearl River Delta in Guangzhou – the Pearl River Delta is the region’s main international production and trading center. Another facility is for customers in the eastern part of China. FedEx offers International Economy Services(IE) and International Priority Freight (FedEx IP). The advantage of IE is that its price is cheaper with slow speed, while the delivery of IP is faster. You can choose a FedEx express based on your needs and goods. UPS is the world’s largest packaging and transportation company and a leading provider of professional transportation and logistics services worldwide. After decades of development, it has now become the world’s largest courier carrier and parcel delivery company. UPS manages logistics information, constantly developing logistics, supply chain management and e-commerce. The scope of management radiates more than 220 countries around the world, and by constantly exploring and developing, UPS is now a world-famous big company. Anyway in international shipping, UPS Express offer Worldwide expedited service and Worldwide Saver service. TNT Express provides express and postal services for businesses and individuals. They offers an efficient delivery network in Europe and Asia. Provide safe and on-time delivery of parcels, documents and freight items worldwide. With the expansion of business, the demand for supply chain management of TNT Logistics has gradually increased. The customer is asking not only for simple work to move the goods from one place to a certain destination, but for more needs for more extraction and multimodal transport. 1. Covers mainland China, Hong Kong and Taiwan. 2. Provides international express and China Local transport services. Its domestic land transport covering more than 500 cities in China. These four express companies provide people with a variety of services at reasonable rates. These services include supply chain design, freight handling, finance, customs clearance, transportation and so on. Any company and individual can get the transportation they want by ordering these services, which is also a wise way to avoid building their own freight department. If you want a quote of DHL, FedEx, UPS, TNT, please contact us. We are a professional freight forwarder, whatever you ship one parcel or more to consolidation, we can handle it. Shipping Label: Get Your Goods To The Right ArrivalChina Post ePacket: Why Is It The Best Way To Send Small Parcel?